In the center of our private community, you will find a quiet pool with a waterfall, BBQ grill and lounge areas. Residents have 24-hour access to our Fitness Center, Conference Room and Media Lounge. Our Resident Café is always open for residents to enjoy a cup of freshly-brewed coffee, utilize the computer and printer at the work station, or hang out with friends while waiting for a ride to arrive out front. Our four-legged residents can also enjoy a treat from our complimentary Bark Bar. Residents receive a technology package included in the total monthly rent with a savings of up to 54% off retail. This money saving package includes 1 gig AT&T Gigapower high-speed internet with speeds up to 1Gbps (that’s 1,000Mbps!) and over 360 digital video channels through AT&T U-verse Gigapower. Use the AT&T U-verse app on your smartphone or tablet to access your digital video anywhere! The energetic vibe of Knox-Henderson is walking distance from your front door. Stroll over to Henderson Tap House, Sushi Axiom, The Skellig or Jakes Uptown Burgers and enjoy some refreshments on a patio. 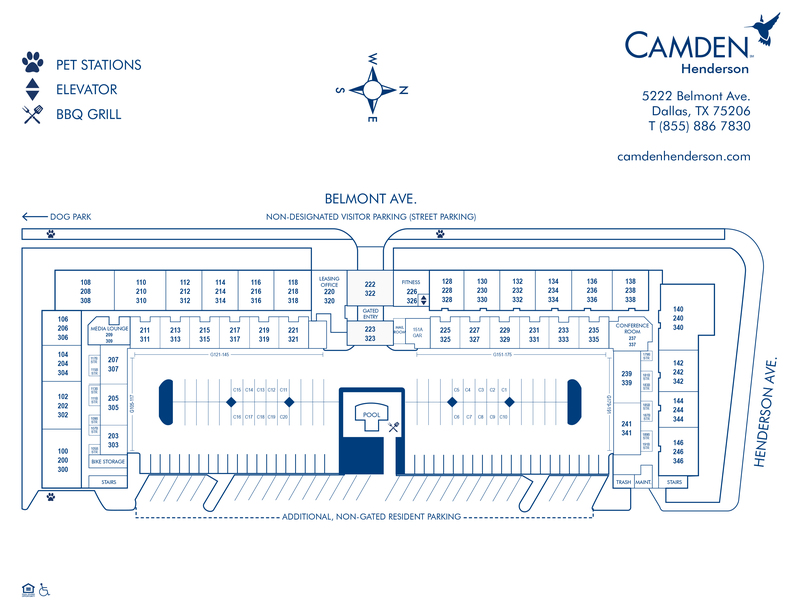 Camden Henderson is also conveniently located just minutes from Uptown, West Village, Katy Trail, and Lower Greenville Ave. Camden Henderson- luxury, urban apartment living that you will not find anywhere else in Dallas. We offer carports and garages for rent. Reserved carports and garages are available for rent. Please call the office for pricing!